2019 First Quarter Review – Foy Financial Services, Inc. The rally began on December 26th with a +5% single-day price jump for major market indexes. By the end of January, the Russell 3000 Index, which tracks the performance of the 3,000 largest U.S.-traded stocks and represents 98% of all U.S. incorporated equities, had advanced +15.7% from its Christmas Eve correction low. This put it back into the middle of the trading range that had contained prices from mid-October to mid-December. The Russell 3000 Index gained +14.04% in the first quarter, +21.1% higher from its correction low. The rally was as welcome and breath-taking as the late-December decline was uninvited and disappointing. The S&P 500 Index gained +13.65%, the S&P MidCap 400 Index gained +14.49%, and the S&P 600 Small Cap Index gained +11.61%. The Dow Jones Industrial Average gained +11.81%, the Dow Jones Transportation Average gained +13.94%, and the Dow Jones Utilities Average was up +10.16%. Technology was the best performing sector, with the S&P Composite 1500 Information Technology Sector up +19.86% and the Dow Jones Internet Composite up +19.39%. Energy, the worst performing sector of the fourth quarter, also rebounded in the first quarter with the S&P Composite 1500 Energy Sector gaining +16.71%. The S&P Composite 1500 Health Care Sector was up +6.89% in the first quarter. International Equities Had A More Modest First Quarter. The MSCI World Index (excluding the U.S.) rose +10.45% in the quarter. The MSCI Europe Index was up +10.84%. The MSCI Emerging Market Index was up +9.92% in the quarter. European equity markets appear to be distracted by the ongoing Brexit negotiations. Tariff talks, especially those between the U.S. and China, continue to dominate international news wires. All parties have been reporting progress, but the world awaits a finalized U.S./China agreement, which may take several more months. The Bloomberg Barclays U.S. Aggregate Bond Index rose +2.94%, the Bloomberg Barclays Municipal Bond Index rose +2.90%, and the Bloomberg Barclays Global Aggregate Bond Index rose +2.20% in the quarter. The best performance was recorded by the Bloomberg Barclays U.S. Corporate High Yield Bond Index, up +7.26%. The Bloomberg Barclays 1-3 Month T-Bill Index was up +0.59%. The U.S. Federal Reserve appears to have abandoned their schedule of increasing short term interest rates, at least for the remainder of 2019. This has becalmed the fears of rising interest rates, flattened the yield curve, and benefited fixed income investors thus far. Market corrections are a fact of life for investors and can even fuel long-term advances. 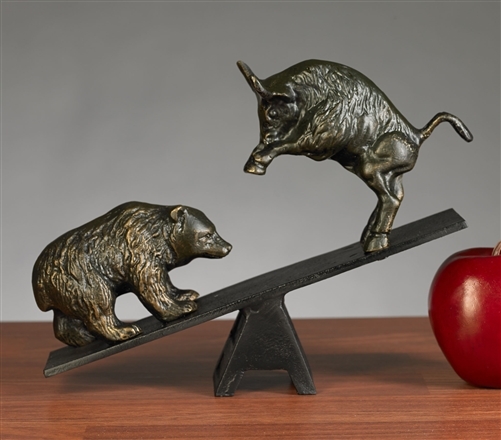 They provide an active forum for both the Bulls and the Bears to exchange opinions. But high-speed trading is an excessive exaggeration of those differences. Its like bringing brass knuckles to a boxing match. The damage, in the form of volatility, may be excessive and the recovery times extended. In our most recent correction and recovery, the loss should not be measured in price, but time. A correction within the context of a long-term Bull market that might have taken six weeks has consumed six months. Equity markets should now revert to long-term positive trends based on the recent positive economic news on payrolls, unemployment, auto sales, single family home sales, and manufacturing. This fundamental date translates into positive GDP numbers which in turn pushes this long-term Bull market farther down the road. There is life after a correction, even a severe one like we saw in the 4th quarter of 2018. © 2019 Edward D. Foy. Sources: Bloomberg, Standard and Poor’s, Morningstar, StockCharts.